A complaint that seems to rear up now and again is that modellers of Scotland are being neglected by the manufacturers. That is to say, while there are plenty of engines that worked in Scotland on the market (e.g. Black 5s), there are few specifically Scottish engines on the market. Hornby’s recent Clan goes some way to rectifying this, but otherwise all there really is for the Scottish modeller is the ex-Triang Caledonian Single and Hornby’s 1980s-origin Caledonian Pug and Barclay diesel shunter. It’s a thorny question. The counter-argument is that there are relatively few Scottish modellers. However, it’s also worth noting that people used to say exactly the same thing about the Southern, now superbly well-supplied. The other point I would make is the Murphy’s Models argument. Irish railways were utterly unrepresented in the model market, other than in the form of a few reliveried and unambiguously British prototypes. Murphy’s Models leapt into that niche and made a success of it. I don’t think it’s ridiculous to suggest that the same thing could happen for Scottish railways, if enough people clubbed together and approached a manufacturer. See, I’m a firm believer that sometimes the model creates the market. I know several people who own a Q1 but are not Southern modellers, but just like the engine. And it seems very unlikely to me that everyone who bought the NRM/Bachmann Deltic models the appropriate line/period for such an engine to make an appearance. I’d suggest something like the Caledonian Railway 439 class, pictured left. It’s small, lasted a long time and is typically Scottish. 74 passed into BR service and one survives on the Bo’ness and Kinneil Railway. The other suggestion I’d make is the Jones Goods, perhaps as a limited edition? These lasted well into LMS days and one, of course, survived into preservation. It performed on a number of railtours in BR days and would add a welcome splash of colour. I’m no expert on Scottish railways, I have to admit, and would welcome all thoughts and comments from other folk. Well, folks, as you’ve no doubt already realised, the UK is gripped by snow. As ever, we can expect transport difficulties and suchlike fun. Yr. Humble Chronicler, paid as he is by the hour, basically has to go into work chiz chiz. A Collett 0-6-0 shows us how it's done. 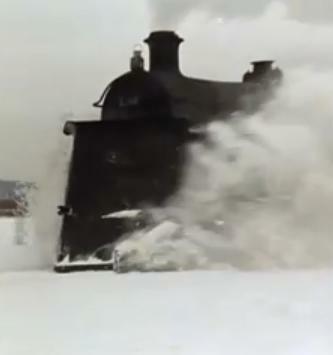 However, in the meantime, here’s a nostalgic look at snow on British Railways circa 1963 – http://www.youtube.com/watch?v=cl4pJwcE7JI. It’s a narration-free, slightly artsy collection of documentary footage set to a delightfully ’60s soundtrack. 57xx pannier and Toad brake van finish clearing the line. As you might imagine, there’s plenty of snow-clearing footage, mostly on the Western Region as far as I can see. Other highlights include some prestigious diesel services featuring a Warship, a Western and the Blue Pullman (all of which was probably, again, filmed on the Western Region). 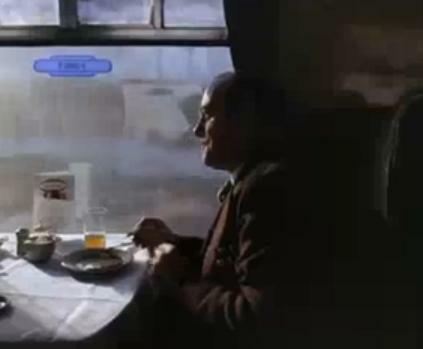 The filmmaker has spliced in some old footage of LMS engines for variety and there are lots of evocative shots of day-to-day operation in what are now termed “adverse weather conditions.” Also for some reason we are treated to film of a gentleman eating his breakfast. All in all, a great resource for anyone planning a snow-set railway. I’ve often thought I’d like to do a snow-based steam-era railway. It offers a lot of potential for unusual operations. 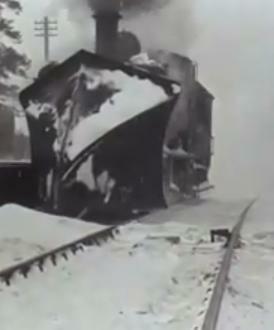 For instance, the snowplough workings that you see in the film would be a good short train to model. 0-6-0s were preferred due to the fact that all their weight was concentrated on the driving wheels, making them both powerful and stable – you could hit those drifts at a heck of a speed, and they might not be willing to move. It was common, as you can see in the film, to pair an engine with a tool van or brake van, which I presume carried a crew in case they ran into trouble. It was also common for two locomotives to be coupled back-to-back, sometimes with the tool van between them. There are also lots of other interesting operating possibilities – double lines singled, diverted express trains, breakdown trains called out to derailments. Perhaps you could even have a whole train stuck in the snow, being dug out. 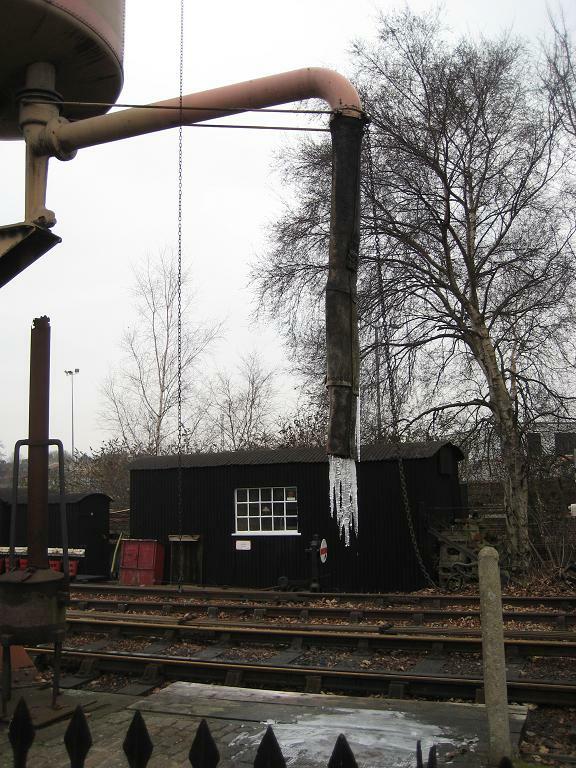 I’ve seen footage of this at the National Railway Museum, and apparently the way to free up frozen motion was to wrap oily rags around it and set it on fire (good luck recreating that). Even so, it might take days to get the train out. Well, I’m pleased to say that my predictions for this year’s Hornby range were, to a man, entirely wrong. I refer you to the official Hornby website for this year’s releases. Briefly, the things I’m getting most excited about are the LNER L1 and B17s. The 4-VEP multiple unit is to be introduced, which will be a nice addition to the expanding number of Southern multiple units available (as well as being units that operated locally to me), although I do wonder if it’s perhaps a bit too similar to Bachmann’s 4-CEP. Having said that, I would imagine there are plenty of people who will buy both – I recall them often working alongside one another, sometimes coupled together. And by changing the interior, they could produce the 4-VEGs that were used on the airport service to Gatwick. Speaking of airport services, a train pack that has piqued my interest is the ‘Imperial Airways’ pack. This consists of a T9, a Pullman composite, a Maunsell brake coach and a bogie utility van, all in Southern livery. This replicates the service that ran out of London Victoria, serving the Imperial Airways airfield at Southampton. Due to the lightly-laid track, the T9 was about the only express engine capable of using the route. I’ve often thought it would be an interesting service to model. AND I WAS RIGHT. It’s a freelance 0-4-0 finished in the livery of the London, Brighton and South Coast Railway. A neat little model and rather appealing. 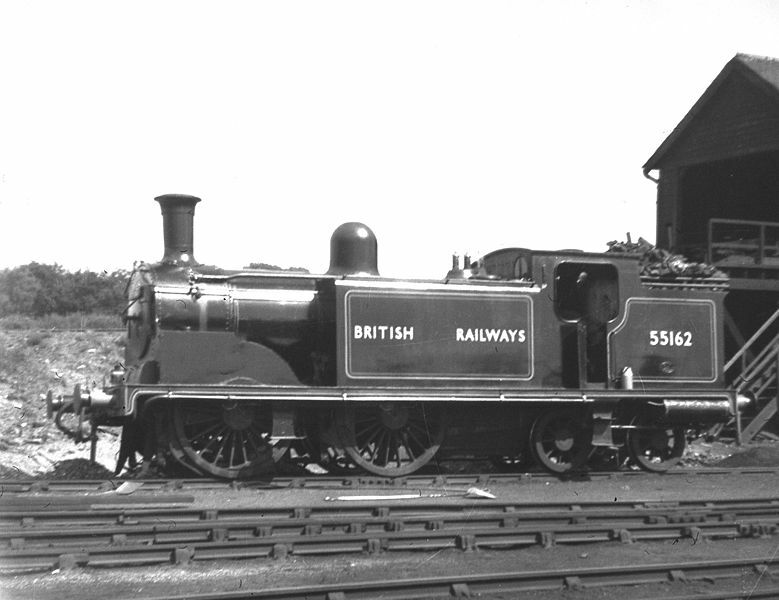 It appears to be based on the LBSC E2, which was an 0-6-0. But I do wonder how this works in terms of copyright. Allow me to explain. Bachmann, as I have explained before, holds the licence to produce Thomas the Tank Engine characters for the North American market. A few years back (2005 I believe) they introduced the Junior range in the UK. The locomotives for this were an 0-6-0 side tank and an 0-4-0 saddle tank, both rather freelance-looking but nice enough in their way (I own both, and crude though they are, they have a certain charm). Unfortunately, the tooling they used to make these was developed from the Thomas range. As a result, they got into a bit of trouble with HIT Entertainment, who own the copyright for Thomas. They have since withdrawn those original Junior engines and introduced a generic 0-6-0 saddle tank and diesel shunter. The problem, you see, was that Bachmann’s tooling was specifically developed for the Thomas range. Hornby can get away with using the same tooling for, say, Oliver the Western Engine that they use for the 14xx in their regular range because the 14xx was developed first. Now, the engine you see above was originally developed for a battery-powered starter set in Hornby’s Thomas range. That is to say that it was specifically developed as a Thomas character. This, I think, might cause them to fall foul of the same problems as Bachmann. I hope they don’t, as it’s a delightful little engine. When I was a small child, I absolutely loved Thomas the Tank Engine. It was my favouritest programme in the world ever. It wasn’t what got me interested in railways – that had more to do with the three or four generations of railwaymen in the family. But it certainly helped. I learnt to read through the books. Much later, I even wrote my dissertation on the original Railway Series books. So I still have a considerable nostalgic attachment to that little blue dock shunter. Which is why I was intrigued by a new book in the popular Haynes manual series. The Thomas the Tank Engine Owners’ Workshop Manual (1945 onwards). The book promises to be a technical guide to how Thomas and his friends work and how the railways of Sodor operate (probably at a loss). This is far from being the first technical guide to Thomas and friends, but it’s the first one to tie in with the television series (as opposed to the original books) and the first one to be aimed specifically at young children. The television series has long been criticised for moving further and further away from railway realism, so this would seem to be a return to the good old days. The book features cutaway drawings of Thomas, Gordon, Percy and Mavis (illustrating a side tank engine, a tender engine, a saddle tank and a diesel-mechanical shunter respectively) plus Trevor the Traction Engine and Harold the Helicopter. There’s also a diagram of how steam engines work and an explanation of how an engine is built, driven and maintained, including a section on the time Henry was rebuilt. An article called ‘The Tracks of Sodor’ explains the basics of railway operation and ‘Old and New Engines’ gives a history of locomotive design (The First Steam Engines, Narrow-Gauge Engines, The First Express Trains, Newer Steam Engines and Diesel Engines) using characters from Sodor as reference points. One niggle here is that Fergus is used to illustrate the first steam engines when he is in fact an Aveling Porter traction engine locomotive – not the pinnacle of modernity, but hardly a pioneer of steam. Given that Rocket has appeared in the books, it would surely make more sense to use him/her/it for this section. There are a few factual hiccups – for one thing, I’d seriously dispute the article on how an engine is built (the cab before the firebox?). From the point of view of the fictional Thomas universe, the manual includes a number of sometimes quite obscure factoids from the books hitherto ignored by the TV series (Henry was built as an experiment, Sodor has a bridge to the Mainland, there’s a rack-and-pinion railway up Culdee Fell), but ignores others (the existence of the little-seen electric railway to Peel Godred is denied). Rather than going with the idea that Henry was entirely rebuilt into a Black 5 following the story ‘The Flying Kipper’, this book states that he was simply given a larger firebox. This, I suppose, explains why the Henry in the TV series looks nothing like a Black 5. All in all, despite a few nitpicks, I’d say this was a perfect present for a young Thomas fan. Older children might find it a little basic, but for the young ‘uns it’s a simple introduction to a complex subject, easy to understand and clearly illustrated and just generally Really Useful. http://www.pegnsean.net/~railwayseries/ – Martin Clutterbuck’s site on the technical side of Thomas, with some contributions by Yours Truly.